Gold is posting gains for a third straight day on the back of the weak tone in the US Dollar. Prices are currently printing new 8-day highs as China's response to new US tariffs earlier this week triggered hopes that a further escalation of trade war could be avoided. On top of that, a forth rate hike this year seems to be unlikely after next week's guaranteed hike, implying more weakness for the greenback and more room for Gold to rise again. For the third straight day, Gold prices are gaining more momentum and printing new highs and seem to be heading to the $1213 resistance level. 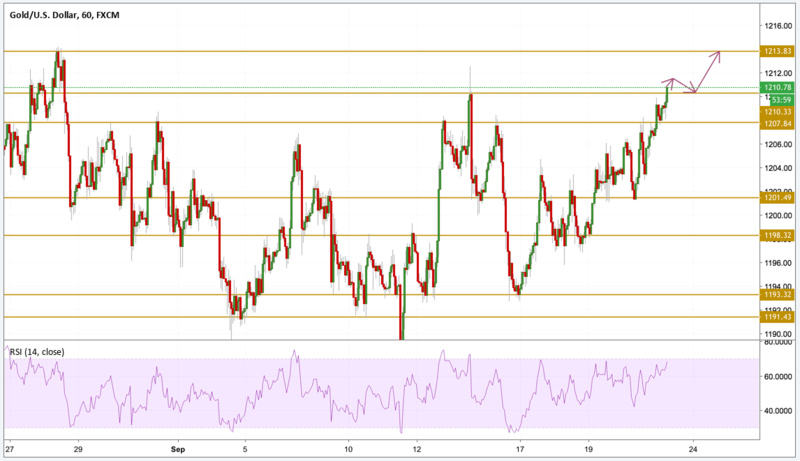 The price is currently trading just below the $1211 level with the RSI yet to signal overbought conditions and no divergences pointing to a continuation of the upward move.